Throughout February, we are sharing multiple great sources of insight that we collected in 2011. The link to the post. The short version is that honesty and transparency in unsettled times pays off in spades for organizations. 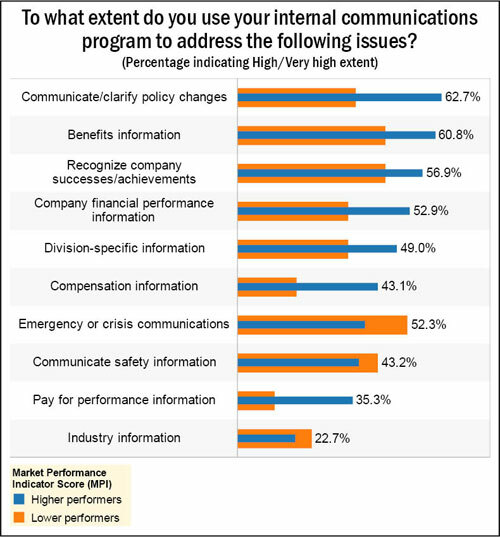 I4cp completed a survey that assessed relative openness of communication for the companies that participated in the survey. You will see in the summary chart below that high-performing organizations communicate better. Companies that fear a “stampede to the exits,” a drop in stock price or simply decreased productivity if they share anything but good news with their organization are on the wrong side of business history. Indeed, if bad news is honestly shared, it is more likely to energize employees to help save the day, either by redoubling efforts, sharing fresh ideas they were afraid to share before, and other productivity enhancers. “We are all in this together” is a trite phrase, but organizations that truly communicate with employees build trust and loyalty, and make that phrase ring true!